The tiny church of St. Leonard is the main focus of the hamlet of Chapel-le-Dale, four miles north of Ingleton. In the churchyard are the remains of several well-known caving pioneers as well as the bodies of many who died building the Ribblehead viaduct. Christopher Francis Drake Long also rests here, the man who discovered White Scar Cave. The grave on the left is of William Metcalfe, who, with John Birkbeck of Settle, was the first man to descend Alum Pot. 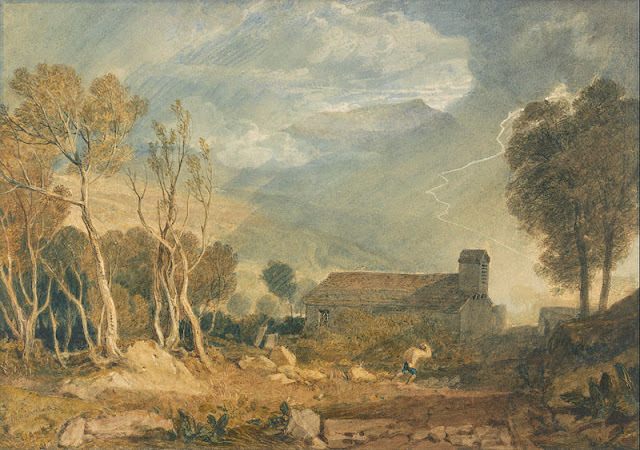 The Metcalfes lived at Weathercote House, behind the church, and would have shown tourists into the famous Weathercote Cave, painted by Turner and engraved by Westall. The chapel from the rear - showing how close the wild limestone scenery is to the graveyard. Just behind the church lies the once feared Hurtle Pot itself, home of the Hurtle Pot Boggart. This is what a first impression of Hurtle Pot is like. The pool at the foot of the pot is a 'window' into the Weathercote to God's Bridge completely flooded cave system. 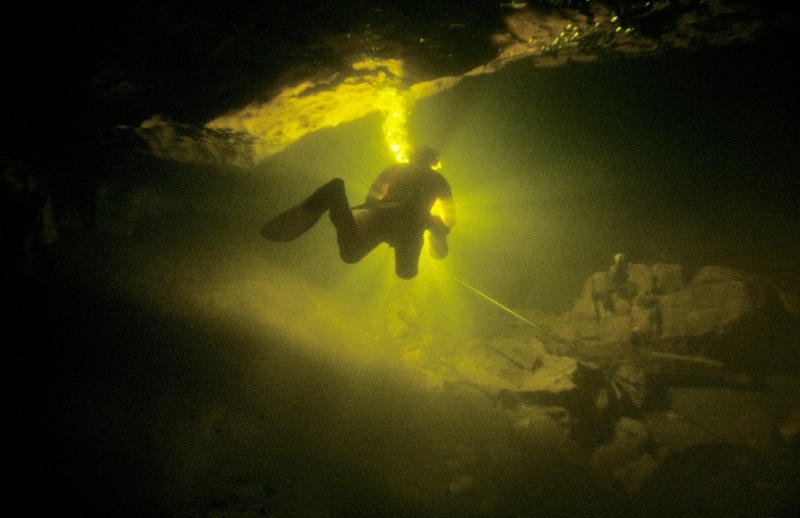 The rope to help divers descend can be seen along the mud slope on the right. It's easy to descend with it, but you get filthy. In the 19th century the local farmer charged threepence to descend, where he would throw stones into the dark pool to listen to the sounds of the Hurtle Pot Boggart. It's a remarkable place. Throw in a stone, wait a few seconds and the deep groaning of spirits within will bubble and gargle in the pool. Folk in days gone by would leave this place well alone. I love it. The Dales we never see: a cave diver seeming to 'hang in space' as he negotiates the upstream, totally flooded passage connecting Hurtle Pot with Jingle Pot. A brilliant image. Fear not! 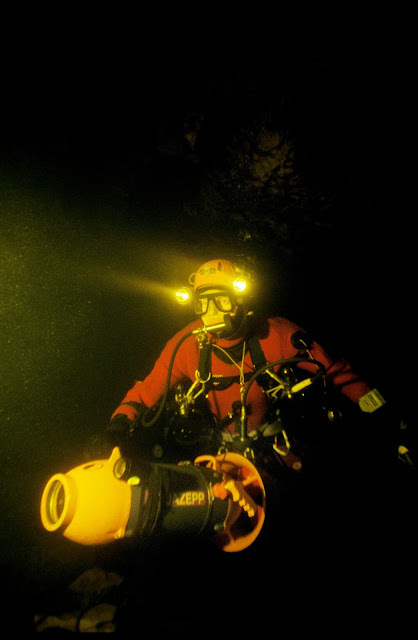 This cave diver, in Hurtle Pot has a specially designed scooter to help him along so he can save energy on the longer dives. It could, superficially, be a 'boggart bazooka.'! The normally dry bed of the beck leads up towards Jingle Pot and Weathercote. A lovely karst environment rich in wild garlic and other lime-loving plants. The diver 'hanging in space' was somewhere beneath this section!! Looking up the beck towards Jingle Pot. Approaching Jingle Pot and the 'dry' waterfall, long since abandoned as now the water makes its way underground. It is active only when the caves below can't take all the water, and was starting to become so as the afternoon wore on. Jingle Pot is rustic and beautiful, encrusted with mosses, ferns and wild garlic, and covered in a jumble of moss-covered branches. I wouldn't like to fall in, though. 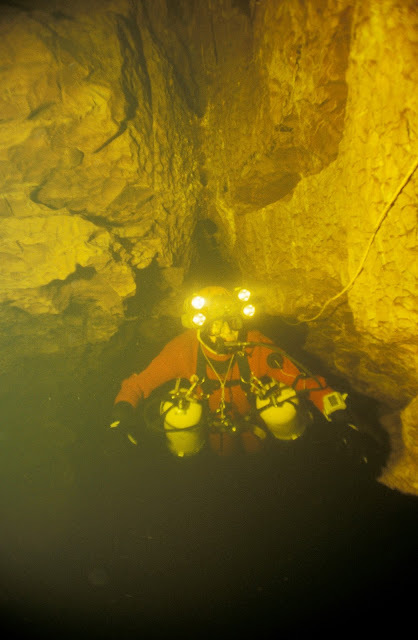 A cave diver 'hangs' in the underwater passages of Jingle Pot, en route to the connection with Hurtle Pot. The moss-covered walls of Jingle Pot, so called because of the sounds water makes in the depths. Throwing stones into this pot produces deep rumbling sounds - so it doesn't just jingle! Again, it's another 'window' into the Chapel Beck flooded cave system. It was throwing it down by this point. A small cavern at the western end admits a delicate waterfall into Jingle Pot, and the fallen trees add a sense of drama. And what a way to end the day. A truly magnificent natural wonder in the heart of limestone country. 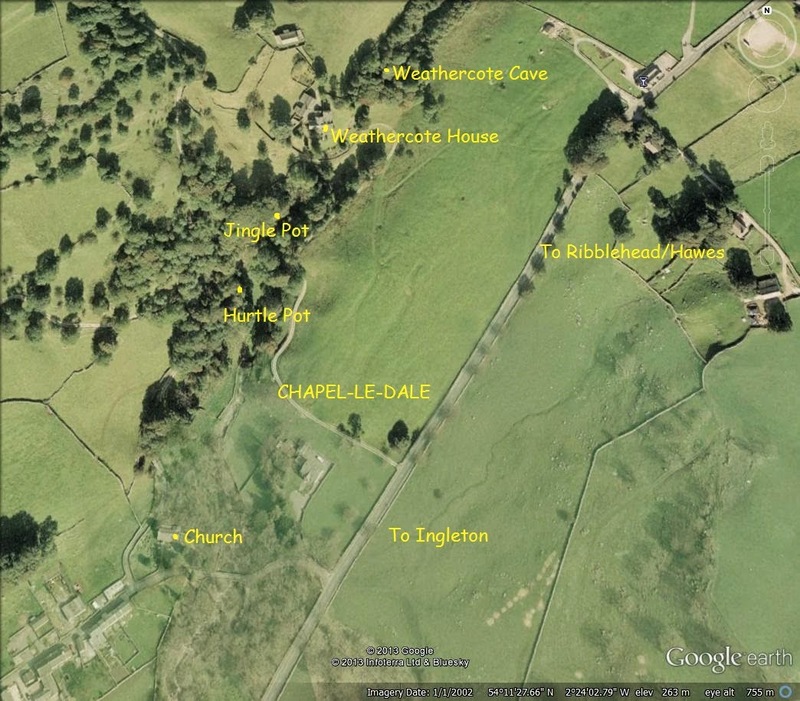 Chapel-le-Dale and the area of the three pots. This Google Earth image is a little distorted at bottom left. Just below centre, the private drive to Weathercote can be seen leading off the main Hawes road on the left (trees at the junction) There is no right of way down this lane. The lane to St Leonard's chapel is less distinct, leaving the main road on the left a short distance below the Weathercote turn-off, and leading to a distinct lane between two walls heading north east from the hamlet . Hurtle Pot is reached by a gate from this lane and lies at the south west tip of the main tree concentration. Jingle Pot is a short walk up the dry river bed and is hidden in the trees. Weathercote Cave lies in the roughly circular group of trees at the top centre of the image. To visit it, write to Weathercote House and ask for permission. The cave has much loose rock and a disclaimer must be signed before entering. 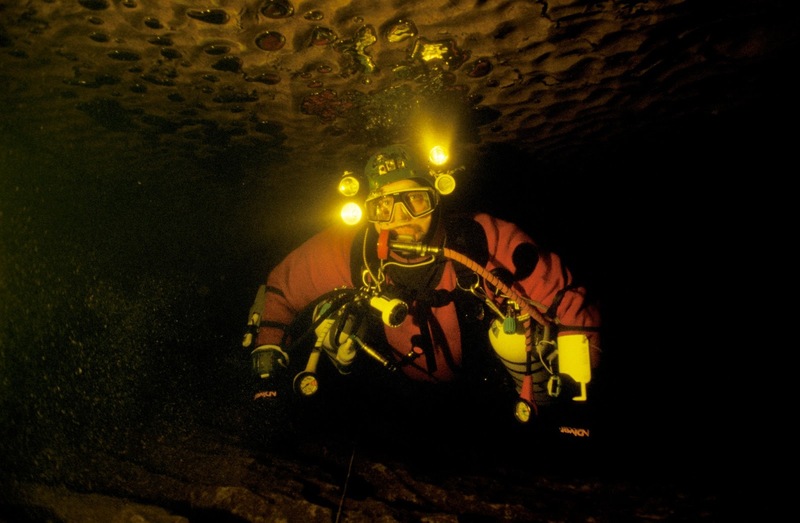 Entrance is strictly at the owner's discretion and large groups, caving groups and children are not usually permitted. Use common sense and treat this very special place with great care - causing as little disturbance as possible. Chapel-le-Dale is an enchanted little corner of limestone country and long may it remain so. It was a very grim day with hardly any light! Well worth it, though. Did you go look at the Bronze Statue that was rescued from Hurtle pot, it is further up the road?